In comic books, super heroes frequently save the day using their super-strength, ability to fly, and mechanized suits of armor. In the real world, though, self-styled super heroes might make a good witness—but that’s about it. In Seattle recently, well-known local caped crusader Phoenix Jones “came to the aid” of Seattle police as they investigated a bloody bar fight, according to KOMO News. It was about two in the morning when officers responded to a report of an assault at a local bar. Responding officers found a bloodied man on the ground and three male suspects attempting to flee into a car parked nearby, according to Jonah Spangenthal-Lee of the Seattle police. When officers approached the three suspects, they fled. After a short foot chase, officers caught up with two of the men, a 21-year-old and a 29-year-old. The third suspect, a 30-year-old, was arrested shortly thereafter. During a patdown of the 30-year-old suspect, an officer noticed blood spatters on the suspect’s clothing. The officer conducting the search thought he felt a handgun in the man’s pocket. The guy said it was his wallet, but it was, in fact, a handgun. As is sometimes the case, the victim in the incident refused to give police any real information about the incident. 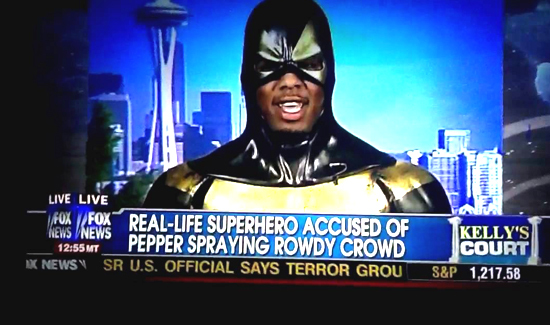 But that’s when Seattle “superhero” Phoenix Jones (real name Ben Fodor) saved the day. He told police he had seen the suspects pistol-whip and kick the victim after knocking him to the ground. Officers booked the two younger suspects into the King County Jail for investigation of assault. The 30-year-old man, who is a convicted felon, was booked for investigation of assault and unlawful possession of a firearm. Police also impounded their vehicle. It’s a bird, it’s a plane, it’s…. Superwitness!